UK-based company, Fripp Design, has been working in collaboration with Manchester Metropolitan University to produce 3D printed prosthetic eyes whose production time and cost are greatly reduced when compared with traditional manufacturing methods. The award-winning company has developed an innovative batch production process that produces up to 150 artificial eyes per hour, making them far cheaper than current handmade versions. 3D prosthetic components are printed in full colour on a Spectrum Z-Corp 510 and then encased in resins however finishing them is much slower because iris customization remains a time-consuming job. Each one has a slightly different hue, allowing for matching with existing eyes, as well as a network of veins. 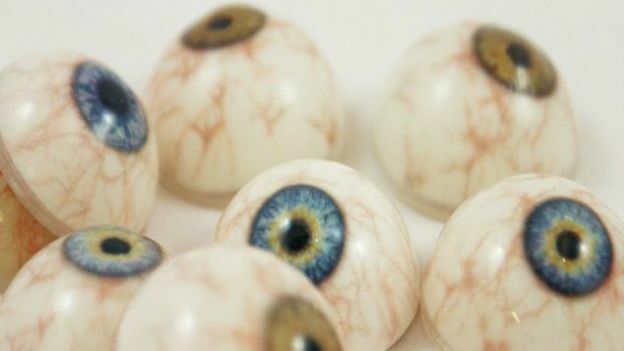 Glass eyes are currently made of special glass or acrylic and then meticulously hand-painted to match the user's other eye. They can cost as much as £3000 in the UK and take up to 10 weeks to receive after ordering. Fripp Design founder Tom Fripp said "Because each one is produced from the same system, the consistency is the same and the cost is drastically reduced to approximately 100 pounds”. The 3D-printed prosthetic eyes may be ready for market within a year. Need new clothes? Just print them out!